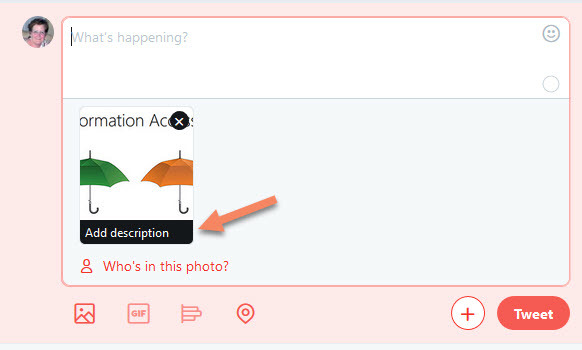 When you Tweet photos using the Twitter app for iOS or Android, or on twitter.com, be sure to compose a description of each image you post so the content is accessible to people who are visually impaired. a) Log in to your Twitter account. b) Click on your profile icon and select Settings and privacy from the dropdown (or press the “g” key quickly, followed by the “s” key). 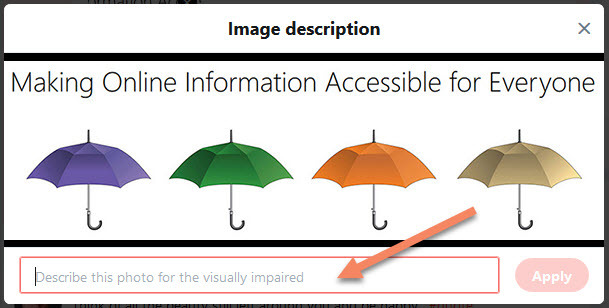 c) Click Accessibility from the list of settings. d) Find the Compose image descriptions checkbox. e) Check the box to turn the setting on. a) Click the Add description option. NOTE: The image description is limited is 420 characters. Including a hyperlink in your Tweet. 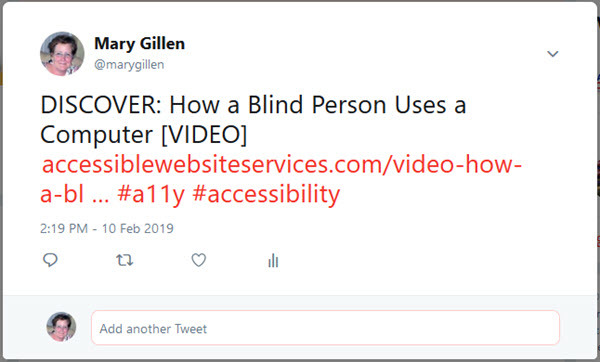 You should indicate what type of file it leads to by adding [PIC], [VIDEO], [AUDIO] or [PDF] to the right of the link so screen reader users will know what they will find when they follow the link. developers, designers and content creators. © 2019 Mary Gillen. All rights reserved.